Rummaging through my long inactive coin collection, I came across this coin that appeared to have some potential as a special coin. I was stunned to find that it was a one year coin. Looking carefully at it, and investigating this mint on this site...I noticed there were 5-6 known errors with this coin. I checked the coin thoroughly, not finding a known error, but noticed something in that process that was not a known error. In image 3285 below there seems to be a die crack running vertically from the leaf to the rim at six o'clock. This line does not appear naturally in the coin (I believe). I would love some feedback about the error, condition, and value of it...as I am not a collector of Canadian coins. I am American, collecting American, and ancient coins recently again. I don't remember how I ended up with this coin originally. 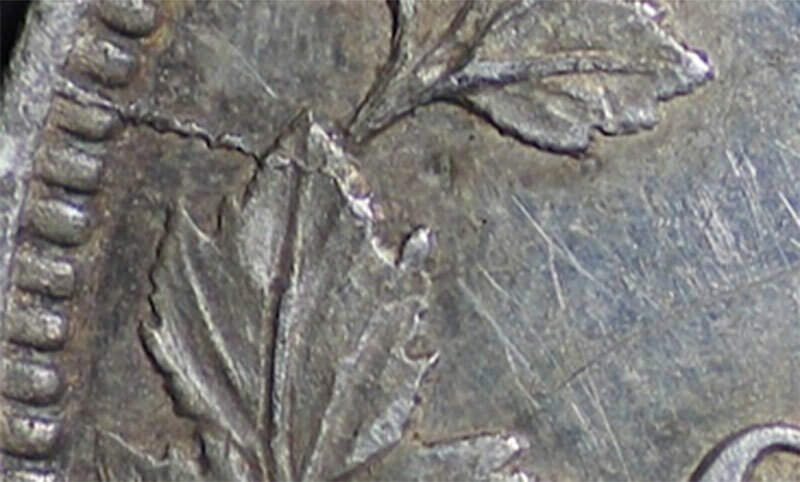 This link shows the known die crack of another error in this coin. It is very close to where this error is found on mine. Thanks for any feedback! This shot captures the suspected die crack (error). Re: I found Something Special...? Die cracks are not errors or varieties. After some use the working dies cracked. D/C's are usually just used as markers for die trackers. Your coin trends for about $250 Cdn or about $200 US and you could probably sell it for about 90-100 US .. too bad about the ding on Vicky's cheek. Yes you did find some thing special ..I love the detail and toning of the coin. This would make a excellent coin for anybodys collection.